If you have bought some of our barbed wire and pickets, here's our way of using them. 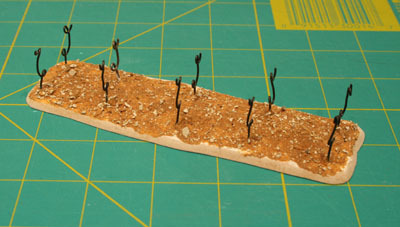 The materials you will need are: Barbed wire - for this model about 1.4 metres, Picket posts - 10, A base - we have use 3mm MDF cut into an irregular rectangle about 150mm by 40mm, A pair of needle nosed pliers - these are used to cut the wire, trim the pickets and get where your fingers can't!, household filler, adhesive for the pickets, PVA, paint, grit, sand and static grass flock. Fixing the pickets to the base. The aim is to get two rows about 15mm apart, with the pickets evenly spaced. We drew two lines and then marked the positions before gluing. The ends of each picket have been bent twice to make an 'L' shape, leaving about 22mm upright. This makes the pickets more stable on the base. Note that the ' L' has been bent in different direction to allow them to be fixed at each end pointing inwards. We used a hot melt glue gun, but an epoxy adhesive or general purpose clear adhesive would also do. The aim is to encase the metal 'L' in a blob of glue and 'weld' it in place. Note also that the loops all point inwards. This is important! Covering the glue. This stage is to disguise the wire and glue on the base. 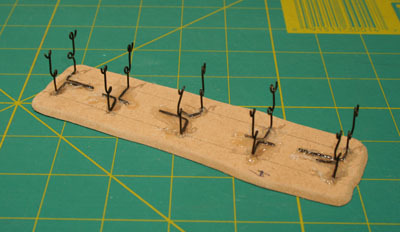 Once the glue has set, the pickets positions are adjusted by bending them to make sure that they are upright. Any long pieces of wire above the top loop were trimmed back using pliers. The base was then smeared with a stiff mix of household filler, with a little PVA added to make is stick better. This covered the glue and wire and gave the base an irregular surface. Texturing the base. A mix of sand and grit was then applied to texture the base. A thick layer of a mixture neat PVA and a little base colour paint (see below) was painted over the top of the base around the pickets. There is no need to go right to the edge. 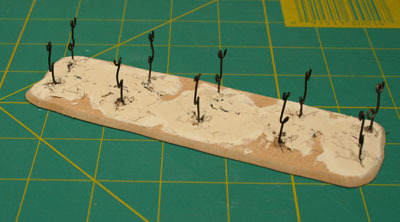 A mixture of sand and grit (we used a couple of grades of Woodland Scenics, www.woodlandscenics.com, ballast and some ordinary sand) was then sprinkled over and left to dry. Don't use too much grit, as it makes the surface difficult to paint. The paint in the glue is too make painting the base colour easier. Decorating the base. Once all the loose sand and grit had been shaken off and the glue dry, it was decorated with paint and grass. First the whole base was painted a base colour of a medium toffee brown. Once dry this was dry brushed with an off white - white with a hint of the base colour. 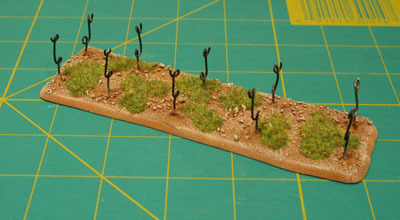 Patches of static grass flock where then added using PVA to complete the base decoration..
Stringing the wire. The wire was strung on the bottom diagonals first, the top diagonals secondly, then the bottom straight runs and finally the top straight runs. This order made it easier to get access to the picket loops and get the wire tensioned correctly. When stringing the wire don't try and use too long a piece. One that will do one set of diagonals, or a straight run and the turn at the end, is about right. Make sure that a little extra (10mm) is allowed to fix the wire at each end and then be generous - there is nothing worse than finding there is too little at the end to reach the last loop and fix the wire! The wire can be fixed by bending it back on itself and twisting the end around the main strand. Only a couple of twists are needed, the rest can be trimmed using pliers. 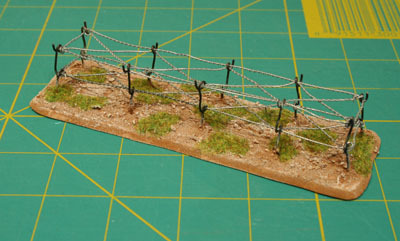 See the modelling tip on adding barbed wire to a dugout for more tips and information. When doing the diagonals it is easier to pull the whole length of wire through a loop completely before going onto the next one. On the diagonals check the pickets after each loop as then tend to get bent out of position and make sure the wire is straight. When a bend in the wire is needed it is best to fold the wire back on its self. This gives a more natural tensioned look and helps keep the wire in place. One the straight runs the wire can be threaded through all the loops at once. 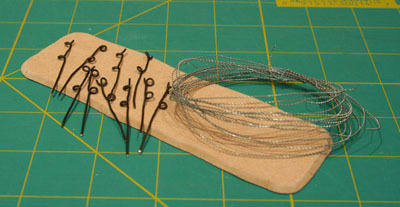 The loops in the pickets are designed to take two or three strands of wire. As an alternative pattern a double concertina can be made. This only needs one row of five pickets, but uses much more wire. Fix, texture and decorate a base with a single row of pickets as described above. Take 1 metre of wire and a rod about 12mm (half inch) in diameter. Wrap the wire round in an even spiral like a spring. The stands should be touching each other so it can be stretched out to the correct length. As an alternative a 12mm bolt can be used and the wire wrapped around the thread. This has the advantage of giving a very even spiral. Slip (or unscrew) the coil off of the rod and pull from each end. Then put this over the row of pickets. The tension in the wire will help to hold it in place whilst its position is adjusted. Make sure a complete loop in the coil is outside the picket at each end, and the coil is touching the base. Repeat with a second coil on top of the first, making sure the top coil is interlaced with the bottom coil where they touch. Add just the picket posts to make sure they are in the right position, paying particular care to the end ones. These tend to be pulled towards the centre by the tension in the coils. 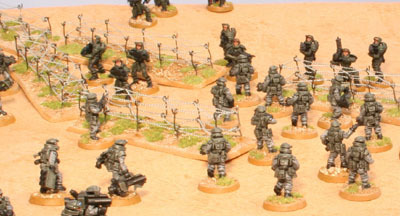 To fix the wire permanently in place put drops of super glue where the wire strands touch each other and the picket posts. Copyright ©, 2005 Tablescape. All rights reserved.